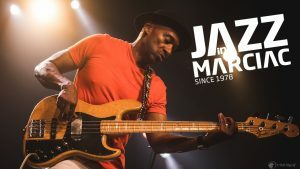 The February edition of Safaricom International Jazz Festival scheduled for 11th- 17th February 2019 is set to feature the two-time Grammy award winner, Marcus Miller. The festival will also be headlined by other supporting acts slated to perform ahead of Miller including Toine Thys featuring Herve Samb from Belgium, Jazzrausch Bigband from Germany, Omni Mor Trio from Israel, Vivian from Portugal, and Yazmin Lacey (UK). Kenyans stars including Kato Change, the Ghetto Classics, and the Safaricom Youth Orchestra will also grace the event with incredible performances. According to Bob Collymore, CEO, Safaricom, this year marks 6 years of jazz and as promised when the company embarked on the journey in 2014. “We continue to work with world-class talent. Our aim is to not only expose and avail platforms for Kenyan acts to collaborate with their more experienced counterparts, but to also showcase our talent to the world. We are glad to be working with Ghetto Classics, the Safaricom Youth Orchestra, and Kato Change to represent Kenya to the world,” said Bob. Over the years, Safaricom International Jazz Festival has been headlined by a stellar line-up of Kenyan jazz musicians like Nairobi Horns Project, Shamsi Music, Mwai and the Truth, AfroSync, Edward Parseen and The Different Faces, Jacob Asiyo and Kavutha Mwanzia – Asiyo, James Gogo, Juma Tutu, Chris Bittok, Limericks, Mambo Tribe and Eddie Grey. The festival couldn’t more interesting than it is with Miller. At the top of his game for over 30 years, Miller is the winner of the 2013 Edison Award for Lifetime Achievement in Jazz (Holland), winner of the 2010 Victoire du Jazz (France) and in 2013, was appointed a UNESCO Artist for Peace. He possesses a distinctive bass sound that can be heard on a limitless catalog of musical hits from Bill Wither’s “Just the Two of Us”, to Luther Vandross’ “Never Too Much”, to songs from Chaka Khan, David Sanborn, Herbie Hancock, Eric Clapton, Aretha Franklin, George Benson, Elton John and Bryan Ferry. With his exceptionally unique style of funk, groove, soul and pure technical skills, Miller has been referred to as one of the most significant bass players in jazz, R&B, fusion, and soul. Miller also has a rich and very deep resume of outstanding collaborations, including a 15-year song-writing and production partnership with Luther Vandross, capped by the hit single “Power of Love/Love Power”. 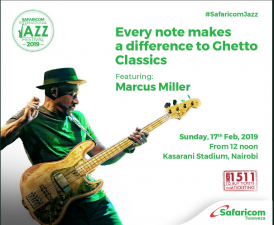 Proceeds from all ticket sales will be donated to the Ghetto classics music program, which has been the Safaricom Jazz beneficiary since 2014 and has so far received an estimated 60 million shillings, funds that have benefitted over 1,400 children from Nairobi and Mombasa. Proceeds from the 2018/2019 Edition will see the Ghetto Classics Schools program extend to Kisumu.